From the YouTube description: "Follow one international student's breathtaking journey through the heart of Tokyo and experience the sights and sounds of Keio University." He actually visited many more places outside Tokyo. These are the things you should look forward to when you visit Japan. If you aren't interested in anything Japanese, or if you're just generally not open to new things, other than a higher income or some university degree, you shouldn't probably come here. That said, while you should look forward to all these wonderful things in Japan, you need to save some hard-earned dough to enjoy these things, learn Nihongo one way or another, and know that in every place, life is not all you see on TV. Or YouTube. Thanks to my friend RL for sharing the link to the video! Another milestone: 5000+ pageviews for the first 29 days of March. Time for another round of Thanks! I wonder though if it's still possible to beat 6,000 this month. Anyhow, I'll keep the posts comin' so stay tuned. Thanks again! Bento! #263: Party sushi + pizza! We had a farewell lunch for one of our colleagues here and this is what we had. I love sushi and pizza! More photos when you click the "Read more" link! 牛 / gyuu = beef. And... you know sukiyaki, right? This is that except it's not yaki because it's not heated in a metal pan. I forgot how to read the 2nd kanji (4th character above)! Kooru suroo sarada / コールスローサラダ / cole slaw salad. 'nuff said. Buta / ぶた / 豚 = pig. ロース / roosu = "roast," but it actually means more like a certain slice of pork usually used for tonkatsu. 焼 / やき / yaki = grilled or (teppan-)fried. 肉 / にく / niku = meat. And of course, bentou / べんとう / 弁当 = "lunch box." Pretty good. I forgot how much -- maybe under 300 yen from the supermarket. By the way, I don't know what akebono means. Maybe.. "dawn"? ...the Philippines! Love 'em. They're healthy, too. They're not exactly large. This one's 128 yen I think though I usually get the 98 yen ones. Coffee mug from SoftBank, given to my friend who availed of one of SB's "promos." I hope you continue to do well. I'll be cancelling my account with you soon. I hope you can also unlock my almost-3-year-old iPhone 4. The best viewing times in Tokyo and Yokohama areas are now from March 21 to April 1! I had a feeling these warm days of the past week would affect the cherry blossoming dates. By first week of April, the flowers would start to fall off already and give way to the green leaves. What's funny though is that the Tokyo/Yokohama area will have earlier cherry blossom views than some parts south (e.g. Kyoto). 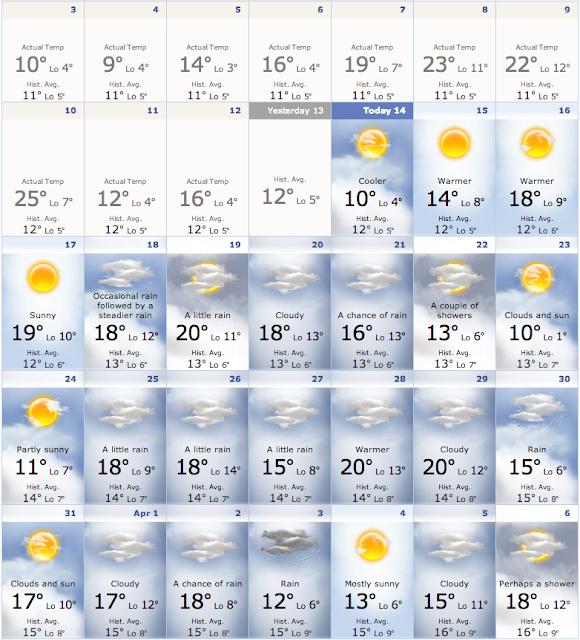 Check out the updated forecast at Japan Guide. Check out this useful infographic from JNTO as well! There was some event one Sunday (last February 3, 2013 to be exact), and I didn't know what it was nor heard of anything about it. But they had a ton of maki (or rolls; more commonly known as sushi rolls) of different kinds at the supermarket. So I got me the "salad roll" / サラダ巻 which was a pretty good meal. From the supermarket. I don't know what that lone kanji means. This was pretty good, but obviously it's "fishy-er" than canned sardines. I love canned/preserved sardines though and this is the first time I had relatively fresher sardines. I can say I love sardines. And (fried) fish in general. The Japanese actually says ダース　クラッシュ アーモンド / daasu kurasshu aamondo / Dars Crush(ed) Almond. I, just recently, have told you about this phenomenon. Bento! #254: Spam + Nori + Rice = Spam Musubi? This was around 450 yen at the supermarket. I wanted the "low sodium" one, but it wasn't available when I went to the supermarket. I bought the cheapest one with 5 packs of this size. I think it was not more than 200 yen for the 5-pack bundle. It came with black & white sesame seed sprinkled rice, and a carrot-tofu-spinach (mini) side salad. Just wanted to mention that last February was our best month yet with 4,278 pageviews, edging out January by 20 pageviews -- and considering January had 3 days more (i.e. 31 vs. 28). Today is March 15, roughly halfway through the month, and we're already at 2,500 pageviews. Can we reach 5,000 this month? This week, almost all that pink is gone now. Can't wait for the sakura in two weeks. In case you still don't know, YES, THESE ARE NOT SAKURA / CHERRY BLOSSOMS. THESE ARE UME / PLUM BLOSSOMS! Image screen-captured today at Accuweather.com. 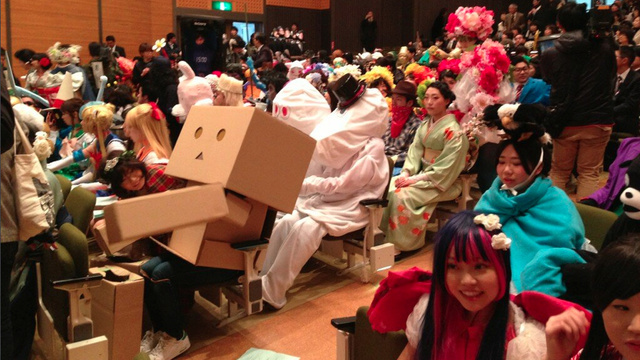 "...At the Kanazawa College of Art's graduation ceremony..., new grads dress up in costumes as they take to the stage and receive their degrees." Thanks to my friends R and C for sharing this link. When you come to Japan, it's good to know the language. Note: I already used 6 and so I'm left now with just 2. You know what it is -- it says "colored spoon." Above it is the description of the contents in Japanese, and it says カラフルスプーン / karafuru supuun. Did you read that out loud? It actually reads more like "colorful spoon." This is just a trivial thing but this is essentially representative of things you might have trouble with when coming here. In Japanese, the "Great East Japan Earthquake" is 東日本大震災 / higashi nihon dai shinsai. Higashi / ひがし / 東 = east, but in some proper names, it is pronounced as とう / tou, as in Tokyo / 東京 / とうきょう / toukyou / east capital. Nihon / にほん / 日本 = Japan, which literally means sun origin, i.e. where the sun rises (because Japan is to the east of China, whereas the sun rises in the east). 日 means sun, but it also stands for day as in nichi / にち. 本 stands for origin, but it also means "main" (as in Hon-Atsugi = downtown Atsugi) or "this" as in 本日 / ほんじつ / honjitsu (usually used in more formal situations, for example, when announcing the day's special menu item, or a special announcement for the day). Dai / だい / 大 = big, as in 大学 / だいがく/ daigaku / university, or literally big school (gaku / がく / 学), although gaku also means "study of," as in 工学 / こうがく / kougaku / engineering, or literally study of industry (or study of engineering). Shinsai / しんさい / 震災 = earthquake disaster. Earthquake translates directly to jishin / じしん / 地震, where ji means ground, and shin means tremor / shaking. Sai means disaster, but disaster (or calamity) translates to wazawai / 災い. Or 海老天丼 / Shrimp Tempura Rice Bowl. From 3F. Pretty good. There's just two pieces of ebi tenpura though, and the rest are veggie tempura like nasu / eggplant, renkon / lotus root, and kabocha / pumpkin tempura. Oh and I think there's a squid tempura in there too. From 3F. Pretty good. Comes with matching orange-colored pickled radish. いくら / ikura = salmon roe (or caviar). しじみ / shijimi = clam? Note that ikura also means "how much." オクラ = okra / lady fingers. なめこ = a type of mushroom. おかか和え = that fish flake "sauce" thing. Pretty good. It's the one on the lower right, which you can see I ate with sanma yaki which I've blogged about earlier. You can also probably see that there's volumetrically more cabbage in there than either corn or potato. :D It's コーンとポテトサラダ / koon to poteto sarada in Japanese, by the way. Or 豚ロースとんかつ弁当, literally Pork Roast Pork Cutlets Lunch Box. You know what it is. Only 498 yen and big and yummy, from the supermarket. Or essentially Char Siu / Roast Pork Pan-Grilled Bihon/Bifun/Chinese noodles. 398 yen from 3F. If you're Filipino, you would be familiar with Bihon (noodles). Surprisingly pretty good for 398 yen!